Content is king, and if your website suddenly goes haywire, you better be able to access all your hard work. And that’s where FTP client software comes in. Simply put, a FTP client allows you to retain control over your files that are located on your server, thus if there’s a problem with your platform, such as WordPress, you can still manage your files through your Mac or PC. The ability to do this is a real lifesaver when things go wrong, and in this post I’ll give you a breakdown of the top – and some of them free – FTP clients available. Along with many more features, Transmit’s focus on speed, performance, and reliability, make it top-level FTP client for your Mac. A simple, easy-to-operate FTP client, WinSCP lacks the exhaustive features of some of the other top clients, but is perfect for those who don’t have particularly extraordinary demands from their file transfer software. With many more features offered, WinSCP is an affordable FTP client that that will give your average Windows user plenty of bang for their buck. If you’re interested in a free client with premium features, then Cyberduck is for you. With an easy-to-use interface, Cyberduck is an open-source client that supports the standard transfer protocols along with Amazon S3 and WebDAV as well. In addition, the free-to-use client supports Growl, Quick Look, and the ability to remote edit. With its numerous advanced features, Cyberduck is a go-to choice who require elite FTP clients without having to break the bank. One of the best for advanced functionality and support, CuteFTP is a premium client with an abundance of security and power. With a variety of features, CuteFTP is well worth the $59 in professional client software. In particular, Tappin allows users to share and access files between your computer to any mobile device which can be essential for those who need file access anytime from anywhere. Free to download, FileZilla is a high popular, user-friendly FTP client that comes with full-throated documentation that provides all the answers to every question a beginning use could thing of regarding FTP software. 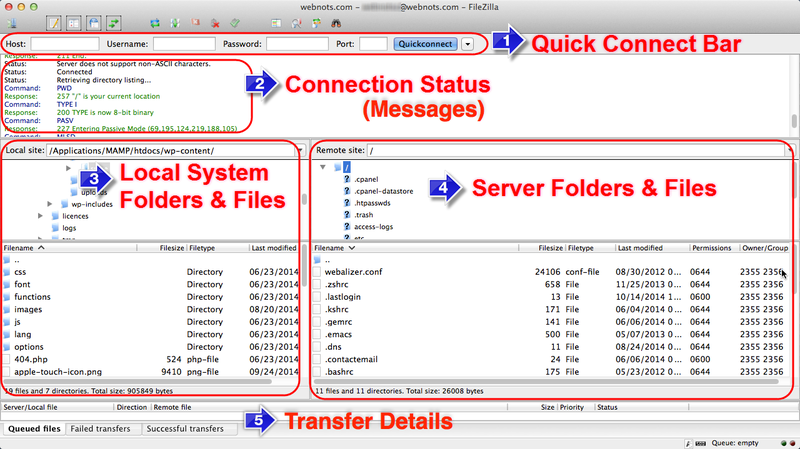 With FileZilla’s speed and full load of features, this free program will definitely meet your sites FTP client needs. Easy-to-use and reliable, Classic FTP is a great solution for your file transfers. Security is a high priority of Classic FTP and its intuitive controls make it simple for synchronization of your files to make sure that their contents are fully up-to-date. With these features and many more, Classic FTP is the right choice for anyone who requires limited client interaction. If you’re looking for a skeletal FTP client to use with a smaller website, OneButton is a simple-to-use, fast to set up, client that almost immediately out-of-the-box will enable you to start transferring files. With a simple and intuitive drop and drag interface, OneButton provides a variety of features that includes the ability for users to store files within a queue until they wish to download them at another time – a highly useful ability for those without high-speed internet or have to spend a lot of time online. If you’re looking for feature-heavy software, OneButton might not be the way to go, however, if you simply need something that nails the fundamentals then this is a FTP client you can’t go wrong with. In the end, with the abundance of choices and software features on the market, the FTP client you select will most likely be based on the needs for your system and what you’re willing to spend. Just remember that companies are always updating what their FTP clients offer and it’s worth the time to keep an eye on the various software out there even after you’ve chosen the one you’re going to go with for now. FTP is used to access the files stored on the server like theme, installation and plugin files. This includes the images, PDFs and video content on your site. But all text content and interlinking structure are stored in database tables which can’t be accessed through FTP. You need to separately backup the database files using the tools like phpMyAdmin from your hosting account. Terry Meiners is a business owner and a passionate writer. Loves to share his experience on business and help people to understand it better. More of his works you can find at Pro Custom Writing. Can I use any of this with a weebly site? If you are using weebly.com then no, it is not possible to access the hosting server with FTP. If you are using paid hosting like Bluehost or SiteGround then you can backup the files using FTP. Thanks, unfortunately (when it comes to backups) Im using weebly.com.